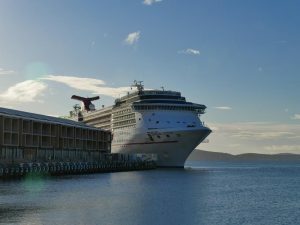 With the Australian summer cruise season coming to a close, Carnival Cruise Line is preparing to farewell Carnival Legend after her third summer of fun down under. 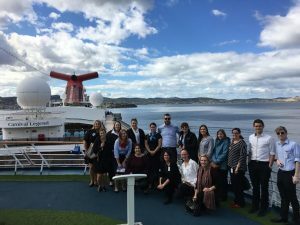 The 88,500-tonne superliner is currently on her final sailing of the season – a five-night Tasmania cruise – with the cruise line taking advantage of a beautiful day in Hobart to show off the ship to a group of Tasmanian travel agents. The ship will farewell Sydney tomorrow, setting sail on a 19-night cruise to Hawaii, ahead of a season of Alaska cruises. During the 2016-17 season, Carnival Legend carried more than 50,000 guests on a variety of itineraries ranging from 3-5 night short cruises in local waters to longer 7-12 night cruises around the South Pacific, as well as the ship’s first visit to New Zealand’s South Island during a 10-night voyage in January. The 2680-guest ship will return for her fourth extended Australian summer season on October 10, 2017, which will see her spend more time cruising around the Apple Isle when she is based out of Melbourne for the first time. In a record Victorian deployment for Carnival Cruise Line, Carnival Legend will sail on six roundtrip cruises from Melbourne during February and March 2018, including voyages to New Zealand, the South Pacific and Tasmania. The ship will again be homeported in Melbourne in November 2018. A 10-night New Zealand cruise from Melbourne on Carnival Legend will take in the sights of the South Island, as well as Wellington, with fares from $1629* for the February 21, 2018 departure.